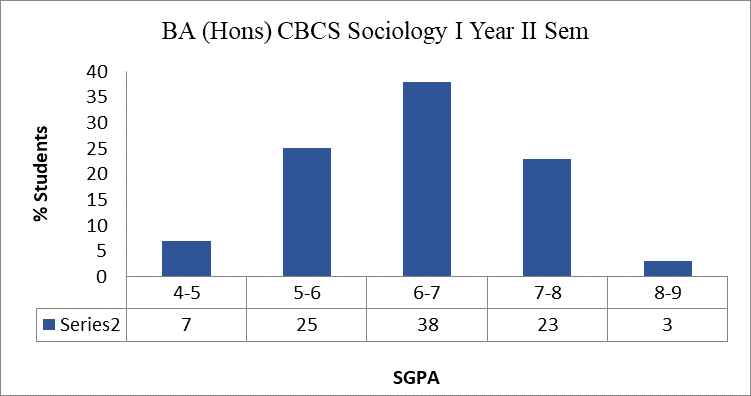 The Department of Sociology offers an undergraduate three years Honours course and Generic Electives to other Honours courses. The department was started in 1974. It trains students to develop a 'sociological imagination' and to make connections between the private and the public domain. The department has consistently been producing two or three University rank holders from each class every year. Equipped with these skills our students move on to successful postgraduate programmes such as social work, sociology, mass communication, human resource management, development studies, and law in the best universities all over the world. Our students find placement in diverse fields such as the media, publishing houses, the corporate sector, the public sector, NGOs (national and international), research, and many other sectors related to development. The students of the Department have represented India at International Youth Exchange Forums, World Youth Forum and as UN volunteers. 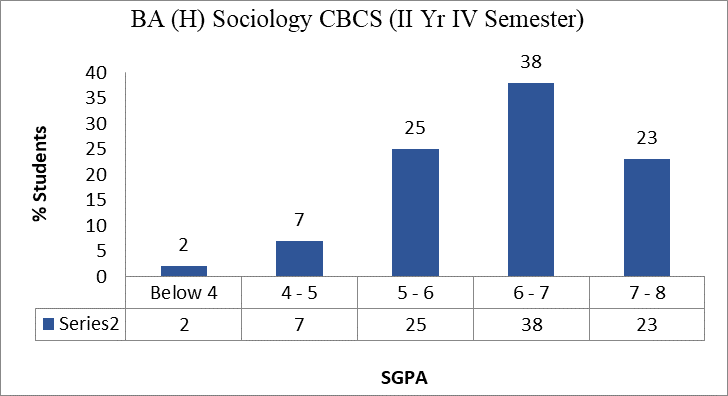 The uniqueness of Sociology demands that creative and imaginative methods are adopted to teach students. 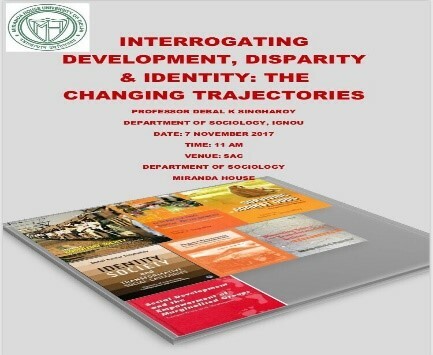 The Department believes in the adage that Sociology surrounds us and that the only way to be truly sociological is to have dialogue with one another. Therefore, the classroom teaching is not top down but is done in an interactive way through the use of chalk and talk, newspaper analysis, films, multimedia and field visits. One of the first lessons given to the students is based purely on visuals. Visual methods provide a means to understand the practices of representations as cultural texts, to develop interpretations of meanings in socio-cultural contexts, and to decode images of social relations and individual experience. These methods applied along with reading the relevant texts drive student motivation and interest in learning, and induce sociological imagination and critical thinking. There are also invited lectures, panel discussions and seminars on themes and issues pertaining to the syllabus as well as sociologically important. Projects are not a mandatory part of the curriculum. However, since its inception the Department has strongly encouraged students to undertake project work. 100% of the first year and third year 100% do a project. In the second year they all make short ethnographic films. The choice of projects is collaborative with the faculty, and the projects are designed to promote an understanding of the subject across papers. 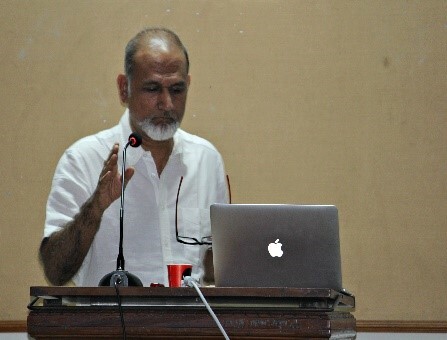 Regular series of lectures are held by the faculty members to teach students techniques and methods of sociological research. The projects involve fieldwork and the use of various research tools like questionnaires, interview schedules, focus group discussions, case studies, film making, social media, secondary sources of literature and also to make use of techniques of sampling. They are assessed on full class interactive presentations. They also make short ethnographic films. 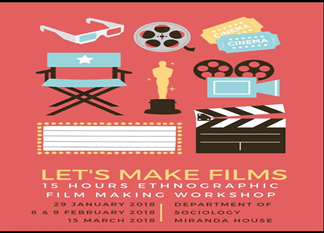 These films are available at Sociology Ethnographic Films. The Project reports of the films are available in the Research Compendium. The students also have an online magazine The Lighthouse with contributions from students. The magazine is available here. As a part of capacity building we encourage students to learn Sociology hands on. 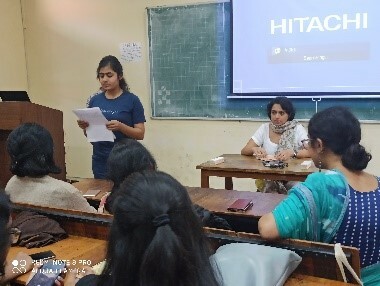 A number of our students have been regularly interning with Neeti AAyog and NGOs, like Pravah, Goonj, Swechha, Centre for Media and Communication and Himalayan Environmental Studies and Conservation Organization, to name a few. Within the college the students have been members of NSS and the Enabling Unit. 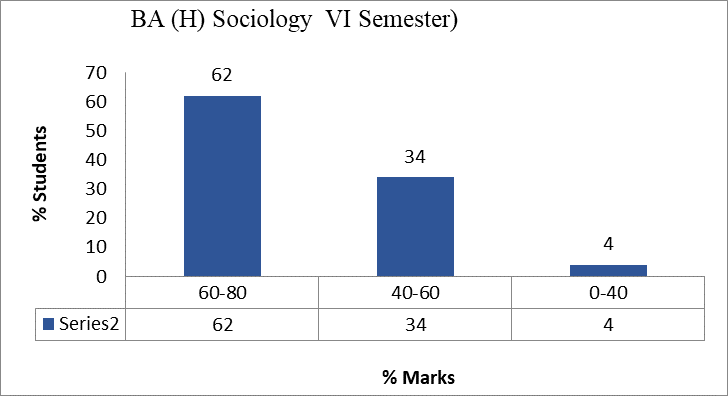 Each year students do well in the University exams. Ms. Sumra Alam (2014-17) was 1st in the University; Pragya Mahajan (2014-17) a visually challenged student was 7th in the University. Ritu Konsam (2013-16), Commonwealth Scholar reading MSc Politics of Conflict Rights and Justice at SOAS, University of London; Amrita Sengupta (2007-10) won the Chevning Scholarship to pursue a one-year Masters at Oxford, 2015; Ankita Gupta, won the Teach for India Fellowship 2017-18; Mahima Sharma (2013-15) received Times Leadership Award for Community Engagement in 2014; Eisha Roy (2012-2015) M.A. Development Studies, Sussex, 2016; Ambassador, King's College London, 2013-2014 and 2014-2015; Ambassador for Peace, Universal Peace Federation, United National Economic and Social Council, 2014-2015; Delegate in Italy, International Leadership Programme with United Nations, 2014-2015; Ritika Sonam won the Erasmus Mundus Scholarship, funded by the European Commission and organized in partnership with some of the most prestigious universities in Europe and India, 2011-2012. Dr. Reema Bhatia was awarded the Distinguished Teacher Award by the University of Delhi, 2009. 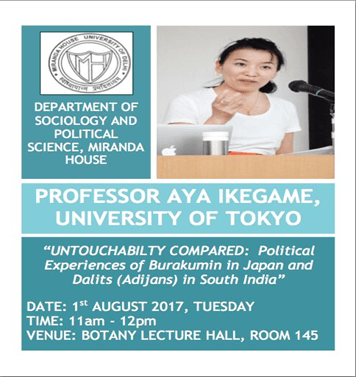 She was a UGC Research Fellow for five years. She has successfully completed two innovation projects under the Delhi University and has guided a team of 20 students for the projects. She has organised several National and International Conferences. In addition she has presented several papers in national and international conferences. Dr. M. Kamminthang was awarded a visiting research scholarship at the Graduate Programme for Transcultural Studies (GPTS), Cluster of Excellence: "Asia and Europe in a Global Context", University of Heidelberg, Germany (Nov 2008-Jan 2009). He has presented papers at several national and international conferences. 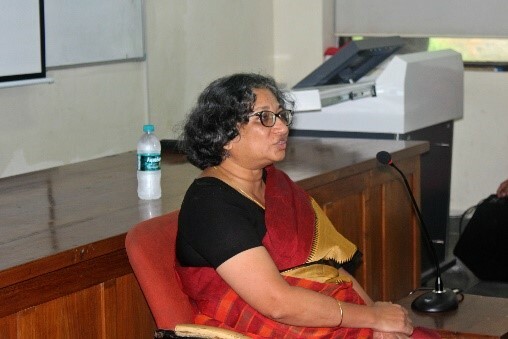 Dr. Avantika Berwa, Dr. Binu Sundas and Dr. Anasua Chatterjee participated and presented papers at several national and international conferences. After graduating from the Department of Sociology, Miranda House many of our students pursue post-graduation and doctoral programmes in many of the institutes of higher learning both within India and outside of India. Our representation can be seen in universities like the University of Delhi, Jawaharlal Nehru University, and South Asian University, Jamia Millia Islamia, Ambedkar University, Tata Institute of Social Sciences, Ashoka University and many others in India. Many of our students have also gone to pursue their higher learning at London School of Economics and University of Manchester, University of Oxford, University of Cambridge and many other institute of repute. Dr. R Rajyalaxmi, Associate Professor, Sociology, JDMC, University of Delhi, Delhi. Ms. Rosy Talukdar is an Assistant Commandant, Assam Police Services. Ankita Sharma is a Manager at SBI. Ms. Amrita Sengupta is working as Senior Consultant at Capgemini Consulting - Digital Transformation Institute, Bengaluru. Ms. Anushree Bardhan is an Associate - Ramachandran and Associates, The Law Firm. Ms Silpa Shukla, Eminent Theatre Artist and Bollywood Actor is also from our department.